Lunch with Murdoch is being touted as a "unique opportunity"
Media mogul Rupert Murdoch is selling himself as a lunch date for $25,000 on the internet site eBay to raise money for a Jerusalem technology college. The chairman of News Corporation has posted an advert on the site setting a starting price of $25,000. The winning bidder will be treated to lunch with four friends at the company's New York headquarters. 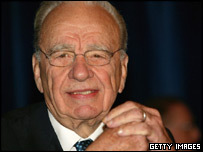 Mr Murdoch has long-established links with the Israeli hi-tech industry, the UK's Guardian newspaper reports. News Corp's satellite TV anti-piracy division NDS has a large presence in the country, the newspaper says. "The winning bidder and four friends will have the unique opportunity to dine with their host, Mr Murdoch and know that 100% of their winning bid will benefit the world class academic institution, the Jerusalem College of Technology," the eBay posting said. The online auction begins on 3 November and will last for a week. News Corp owns media companies around the world, including Fox news and the New York Post newspaper in the US, and the Sun and the Times newspapers in the UK.